Many cooks avoid making a trifle for Christmas because of the time it takes - time that could be better spent drinking! Here is the easiest recipe in the world and is inspired by Terry's Chocolate Orange, everyone's favourite at this time of year. Go on, have a go, you won't regret it for all the plaudits you'll get. Make it the day before you need it and chill overnight. It will keep for 3 days in the fridge. Melt the chocolate in a heatproof bowl over a pan of simmering water, ensure that the bowl does not touch the water. Alternatively, melt the chocolate in a bowl in the microwave in short bursts, stirring regularly. Leave to cool for 5 minutes, then stir through the custard. Meanwhile, put the cream in another large bowl with the orange zest and icing sugar. Whip, using an electric beater until you get soft peaks. 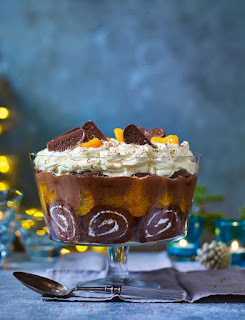 Start building the trifle in a large glass trifle dish or glass bowl. Lay the Swiss roll slices across the base and up the sides of the dish. Drizzle over the juice from 1 tin of mandarins to soak into the sponge. Spread the marmalade over the sponge with the back of a spoon and scatter over the drained mandarin segments from the tin. Spoon over all the chocolate custard. Drain the other tin of mandarins, discarding the juice, and layer the fruit on top, reserving six segments for decoration. Then layer on half of the chocolate orange segments. Spoon over the whipped cream and decorate with the reserved mandarin segments. Use the remaining chocolate orange over the top of the trifle. Chill for at least 4 hours or until ready to serve. My thanks to Chelsie Collins for this super recipe. It's so easy!